Catalonia no longer fits within Spain and needs to explore the option of independence, according to a leading nationalist and former head of the Catalan regional government. “I haven’t changed; the country has changed,” says Jordi Pujol, president of the Generalitat, the Catalan government, from 1980 to 2003 and long a bulwark against separatism and a bridge-builder for governments of both right and left. 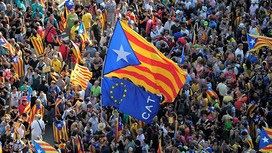 “We don’t fit any more inside Spain,” Mr Pujol, Catalonia’s pre-eminent nationalist leader during the transition from the Franco dictatorship to democracy, told the Financial Times in an interview in London.